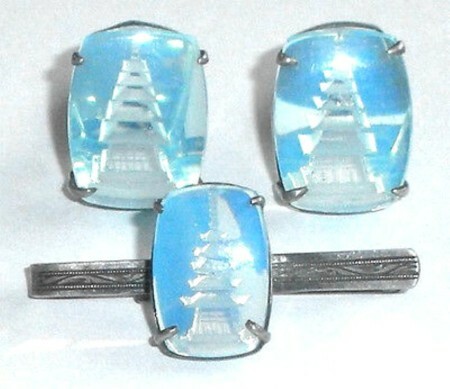 This is a beautiful older vintage all hand made Japanese 950 silver mens cufflinks and tie bar set. Marked Japan Silver, tested, better than sterling silver. It is very large with broad settings and hand etched tinted blue glass pagoda tops. These tops are very, very thick and chunky. 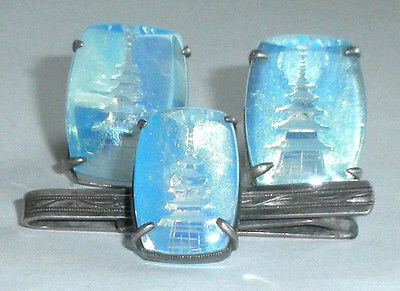 They are etched from the back so you see the pagoda clearly inside the glass. Size of each top is 15/16″ by 11/16″ by 7/16″ deep. They are very large, showy and noticeable. The tie bar is 1 9/16″ long and narrow, 3/116″ wide. Weight for all 3 pieces is 27.2 grams. Condition is excellent, gently used. The swivels on the cufflinks work freely and easily. This is a stunning vintage cufflink set for you collection or showcase display. Very vintage and very unusual. 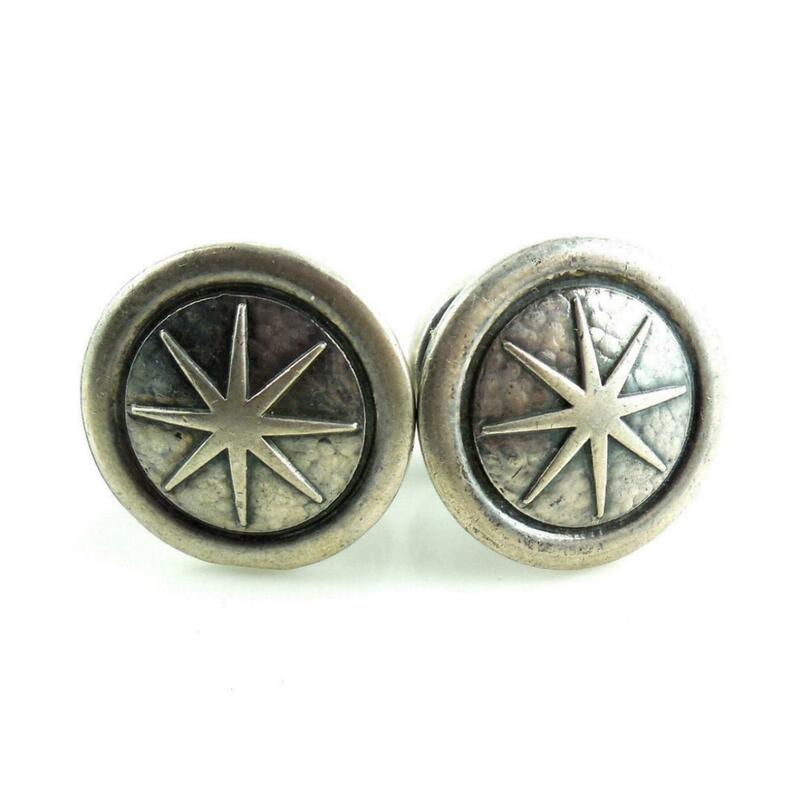 This is a large pair of hand hammered, 900 coin silver, mens stiff cufflinks with raised 8 pointed stars. They are marked 900, tested and guaranteed to be solid 900 coin silver. They also are solid and well made. Weight is 13 grams. Size is 11/16″ across the tops by 9/16″ tall from the back link to the top. The 8 pointed star has many different cultural meanings ranging from the symbol of the Sun God Shamash from the Mesopotamia Region to the astrological meaning of the 4 corners of the universe to various religious connotations to the Mayan 8 point star. These links are from an estate and in excellent overall condition. No dents or dings. No tears or deep scratches or gauges. No repairs. Some age tarnish. Never monogrammed on inscribed this is a lovely pair of early large hand hammered unusual 8 point star coin silver cufflinks for your collection. 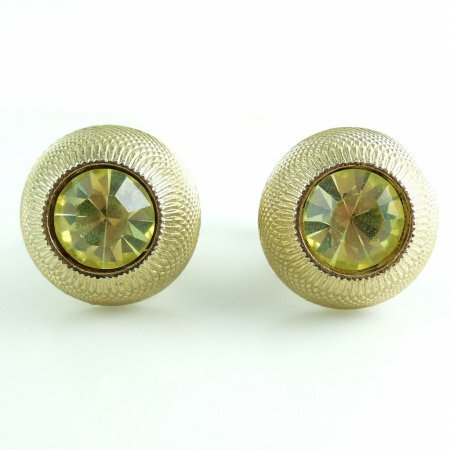 This is a pair of vintage lemon green faceted glass citrine swivel cufflinks in beautiful, no wear condition. All gold intact. Crisp, clean, clear stones. The tops are 13/16" across and 5/16" deep. They are strong and very well made. The swivels work easily. 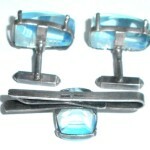 Lovely late mid century era cufflinks for your collection. Please see photos and read product description for any further details. 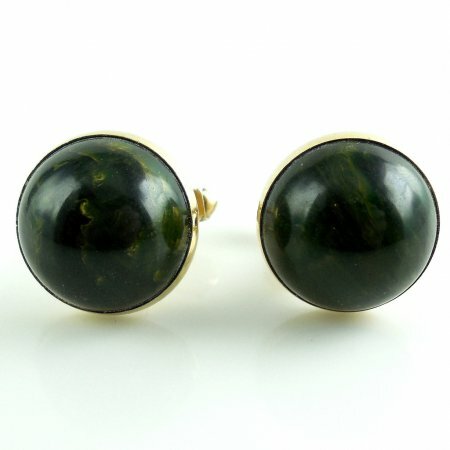 This is a pair of vintage Swank cufflinks with marbled green early hard plastic cabochon tops in excellent condition. The marbling shades from forest greens to green to lemon lime color. Size is of each top is 11/16" across. Condition is excellent having only some very light minor age wear on the backs. The gold is all still bright and shiny. The swivels are strong and secure. They work easily. 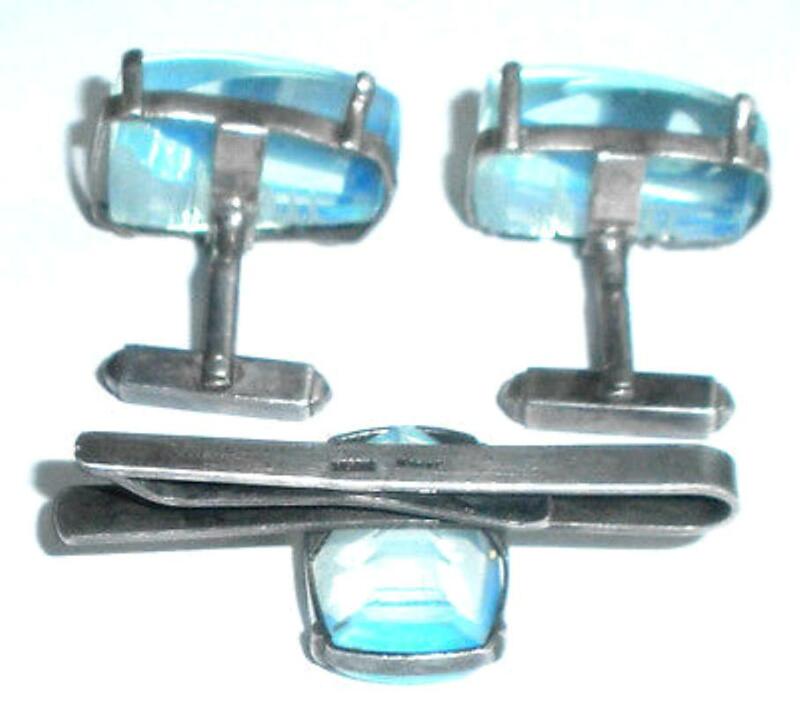 This is a lovely pair of cufflinks for your vintage plastics, bakelite, lucite or cufflinks collection. 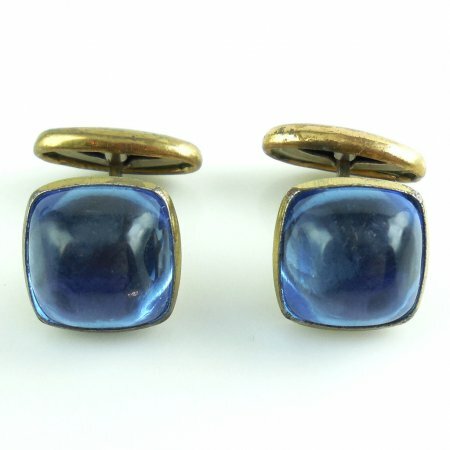 This is a pair of late Art Deco Retro mens swivel back cufflinks with deep blue early plastic or thermoset cabs. Each link measures just about 1/2" square. 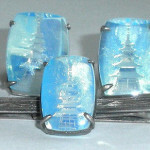 They are medium blue color with strong glow and good flash.The cabs measure 12mm square by 6mm tall. 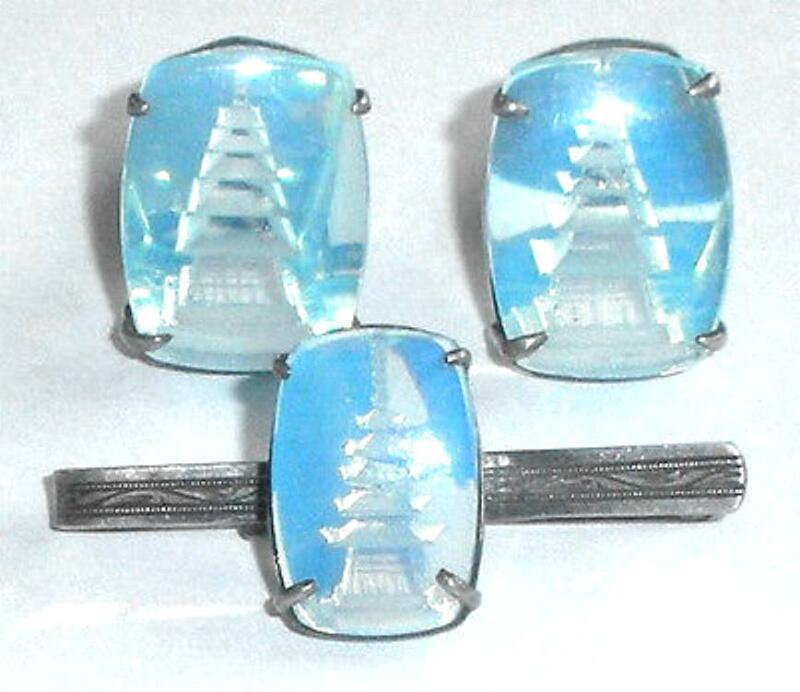 A lovely old pair of estate cufflinks for your vintage jewelry collection.